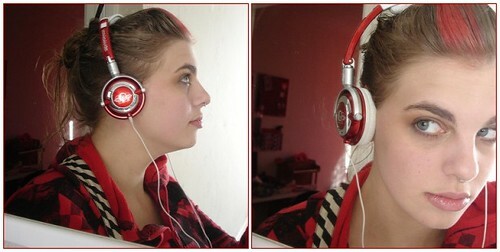 These Lowrider headphones from Skullcandy certainly do! They are easily the most stylish headphones I’ve ever owned. If red isn’t your thing, they also make a ton of other styles and colors that will be sure to make you swoon. My favorite thing about these headphones, however, is the warranty. Not only is it great coverage on a phenomenal product, it’s the most creative and charming piece of copy I’ve seen in a long time. Skullcandy is proud to provide he best product warranty in the industry. If this product should fail in your lifetime, we will replace it at no charge. If the product is damaged by aggressive music listeners sliding a rail, sliding down the emergency ramp of your aircraft, slammed in your locker, slammed in your car door, run over by a car, running into a wall, getting run out of town, mountain biking, road biking, sky diving, beating up your boyfriend, blown up in an accidental experimentation with flammable substances, or damaged in any other every day experience, it means you are living your life the way we want our product used! In these, or any other damaging events, we will replace the product for a 50% discount from retail. They also came with a ton of stickers, and even a stencil of the company logo. I think I may just buy myself a pair of their earbuds, too. That’s awesome! I’m loving this “cute tech” series you’ve been doing. thanks Lis! I’ve gotten good response so far, so I suspect I’ll continue doing this article for a long time. i love skullcandy products! i used to have a pair of green ones, but of course i broke them & then lost them & had no idea about their awesome return-refund policy. p.s.–SUPER duper cute photo on the left, there! It’s one of my favorite recent ones. You do get prettier all the time, LD. love these head phones! They are so good and would recommend them to any one. I now haw 2 pairs one in silver and in purple…AWESOME! love these headphones! i want one for my birthday and i absolutely don’t want to buy it on the internet.. does anyone knows a great shop? I’ve seen them at Best Buy if you have one around where you live.